During the 1790s, Notre-Dame suffered desecration during the radical phase of the French Revolution. In 1845 extensive restoration began with ongoing maintenance throughout the years to preserve this historic monument. Notre-Dame was among the first buildings in the world to use the flying buttress. 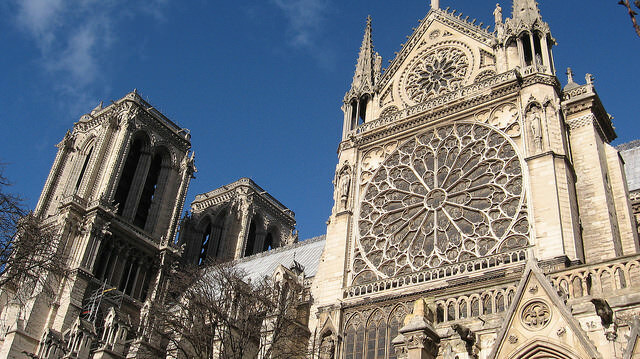 The building was not originally designed to include the flying buttresses however after construction began, the thinner walls grew higher and stress fractures began to occur as the walls pushed outward. In mitigation of further damage, the cathedral’s architects built supports around the outside walls, and later additions continued the pattern. Many small individually crafted statues were placed around the outside to serve as column supports and water spouts. Among these are the famous gargoyles, designed for water run-off, and chimeras. The west front of the cathedral is one of its most notable features, with its two 228-feet tall towers. The South Tower houses the cathedral’s famous bell, “Emmanuel.” The bell weighs over 28,000 pounds and is Notre-Dame’s oldest bell, having been recast in 1631. The beautiful West Rose Window dates from about 1220 and measures 10 meters in diameter and exceptionally beautiful which retains most of its original glass and tracery. The main theme of the west rose is human life, featuring symbolic scenes such as the Zodiacs and Labors of the Months. Notre-Dame’s stained glass windows remain an important and beautiful collection of 13th-century Gothic art, with interesting details well worth exploring in more detail. The highlight and the greatest survival of original glass is the set of three beautiful rose windows, which shine like jewels over the west door and in the north and south transept. The abutments of the doors have panels representing the natural universe, or life on earth. The panels on either side of the portal are weathered but elegant Zodiacs and Labors of the Months. The positions of the months echo the yearly cycle of the sun: rising in the sky from January to June (left jamb), then descending from July to December (right jamb). Completing the symbolic medieval universe on the inside jambs are the seasons (left) and the ages of man (right). 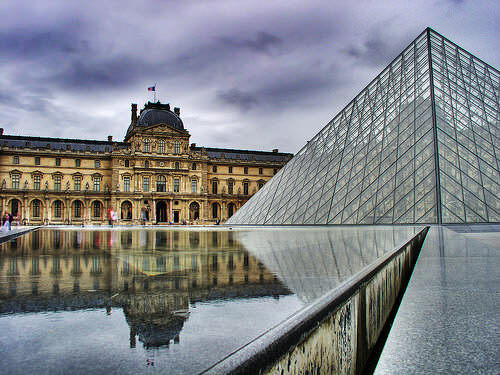 Every corner of this magnificent structure holds historic treasures and mystery.